London-based designer Nir Meiri has created a series of table lamps using mushroom mycelium, as an alternative to synthetic materials. The shades for each of the minimal table lamps is made from mycelium – the vegetative part of a fungus – while more conventional metal forms the stand and base. Each lamp is illuminated from below by a separate light source, which projects onto the mycelium shade to create a soft, natural glow. Produced in collaboration with London-based startup Biohm, which works to bring sustainable solutions to the built environment, each of the lamps are made using naturally occurring biological processes. To create the shades, paper waste is placed inside a shaped mould before mycelium spores are inserted into it and left to grow under controlled conditions of temperature and humidity. After two weeks the paper waste is been consumed by the fungus, leaving a mycelium base with fungus growing from it. This material is then taken out of the mould and left to dry, and the excess growing fungus is removed. Once the mycelium has dried completely, it is pressed to form a flat substance that is used as a lamp shade. 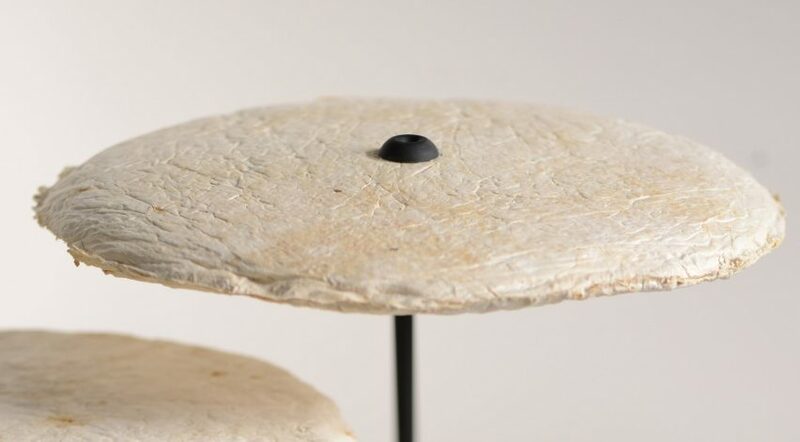 Due to the way mycelium consumes waste, Meiri believes that developing the fungi material for use in furniture, lighting and construction could significantly impact the way we can dispose of synthetic waste. 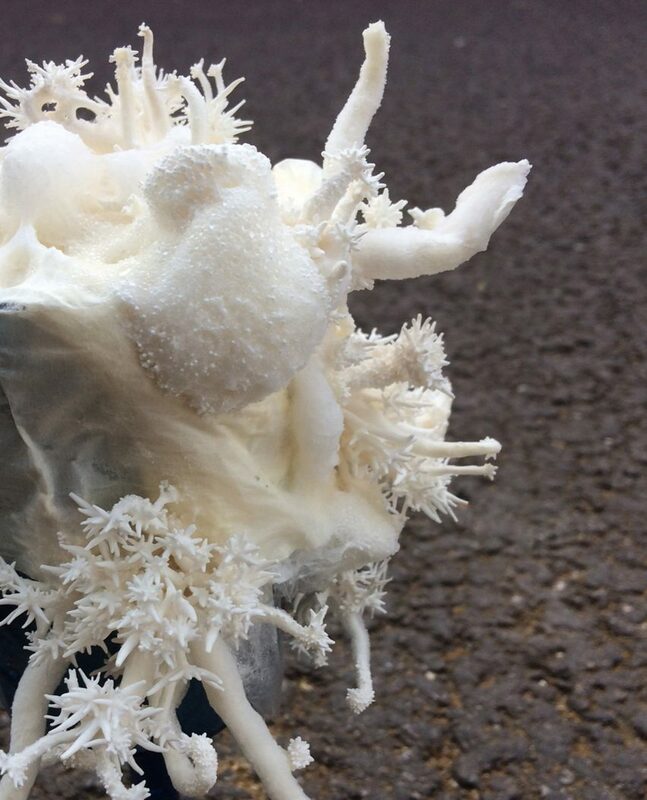 According to a report conducted at the end of 2018 by scientists from London’s Kew Gardens, fungi can be used to break down waste materials such as plastic, as it is able to grow on its surface where it secretes enzymes that break the chemical bonds between plastic molecules. Having previously experimented with unusual materials to make lighting, such as sand, seaweed and sea salt, Meiri’s intention with his work is to maintain the natural look and feel of the organic materials while applying them to industrial product designs. 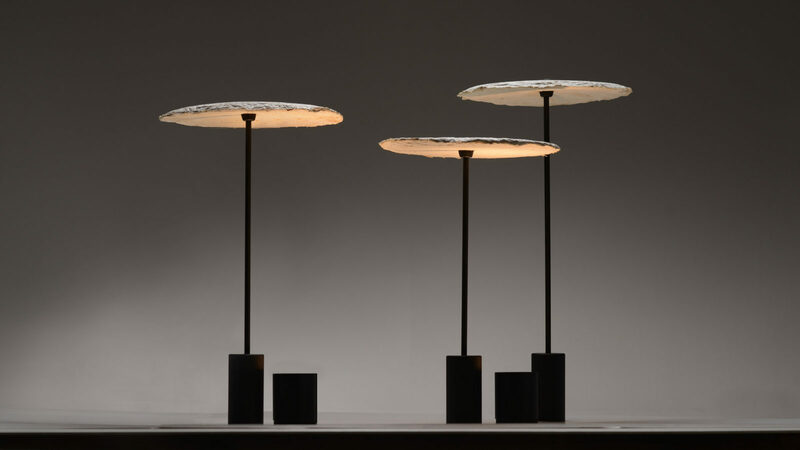 Meiri not only directly used mycelium as a material, but he also took inspiration from the fungi for the design of the lamps, imitating the shapes of mushrooms growing in the wild in a bid to create “a little garden of lights”. “When introducing these materials into the domestic environment as light fixtures, I try to keep the beauty of the original material without damaging the function of the object,” he explained. The mycelium lights were initially launched last year during London’s annual design festival in two different locations – first at an exhibition called Sustainable Bankside and second at a show called Open Cell, which took place as part of the Biodesign – Here Now exhibit. Mycelium is a material being more widely explored in various architecture and design experiments of late, including a self-supporting structural column and an intricately textured dress.